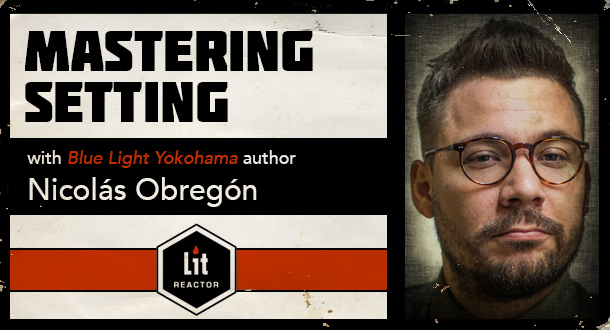 Become a black belt in backdrop in this three-week workshop with acclaimed author Nicolás Obregón, where you'll learn to make your setting just as vital as your characters. Setting is place. Setting is time. Setting is the world of the story itself. Put simply, it is one of the most important elements in writing. Yet all too often, a writer’s energies are spent focusing on plot and character while setting is relegated to two-dimensional afterthought. Poorly rendered backdrops can drag great writing down to mediocrity. But done right, setting can be one of the most formidable weapons a writer has in the battle to capture a reader's imagination. Backdrop should never just be empty decor when it can be the very lens through which readers experience the milieu of your character’s world. Nicolás Obregón is an internationally published author with book deals in the US, the UK, Europe, and beyond. His debut novel, Blue Light Yokohama, was declared by NPR Radio as "a stunning debut" while the English press hailed it as "an outstanding, exceptional, beautifully-written debut..." His forthcoming novel, Sins as Scarlet, has already been announced by renowned novelist Jeffery Deaver as "a masterpiece", while bestselling sensation AJ Finn labelled it "extraordinary stuff... I’m awestruck." Nic’s writing has been nominated for several prestigious international awards and is a former writer for one of the leading travel publications in the UK. He is also a graduate of the acclaimed University of London’s creative writing Masters course. Classes will be warmly collaborative, reciprocal, and encouraging. All skill levels welcome. In Week One, you will start by exploring the importance of setting. A shabby stage with little thought put into its construction could hinder even the best actors, experiencing the greatest drama. You will examine both contemporary and classic exemplars of setting in fiction and how they help (or hinder) story. These exemplars will become your Lego blocks to build your own versions of Capote’s, Orwell’s, or Allende’s worlds. In this week, you will also be compiling a list of striking settings for use in future writing. You will examine the ‘promise’ setting is making to your readers and the advantages and disadvantages in the expectations that this will lead to. You'll also be talking nuts and bolts: can you write a novel about England if you’ve never been there? What about Medieval England? The authenticity of your setting will be crucial in crafting good fiction. Building on week one’s findings, you will delve into the key elements of creating a striking setting within your own storytelling. You've already covered the importance of setting. The flip side is that nobody needs the sun to be described as a blazing hot giant ball of gas, readers know what the sun is. In the final week, You'll be discussing the importance of equilibrium between character, plot, and setting. You'll also be exploring how setting will allow you to interweave themes and motif into your writing. You'll be wrapping up with a 1000-word piece of fiction to showcase the strength of your backdrop-writing. Throughout the three weeks, you’ll be given writing assignments to test and play around with the class findings. These will be critiqued by Nic and your classmates. Harness the power of setting as a vital aspect of your storytelling. Enrich your narrative landscapes with motif and connotation. Avoid passive scenery by bringing the world around your characters to life. Embrace the idea that by reaching out to setting, you are reaching into your reader’s imagination.